Teaching kids about plumbing is a great way for little ones to learn helpful skills like conserving water and other responsible behaviors. Following these tips will help prevent plumbing issues in the future. Also there is some bonus fun at the end of the blog that will keep kids entertained and engaged. Young kids – At an early age kids are fascinated with water, toilets, and everything else they can get their hands on. Teach them what is okay and not okay to do in the bathroom so you don’t run into problems later. Toys – While it’s okay for bath time it’s not okay to give them a bath in the toilet. Dental Floss – It can snag into something and cause blockage. Hair – Weather if its from the shower drain or the brush it should go in the trash. Diapers- Kids who are learning to potty train think that it’s okay to take off their diaper and put it in the toilet. That’s a big no no. Extra tip : As kids brush their teeth, make sure they keep the water off until they’re ready to rinse. Doing this helps conserves resources and keeps the utility bill lower. Know how to properly clean the dishes before loading them into the dish washer. Know to only run the dishwasher when full. Same goes for the washing machine. This helps saves water. Shut the water off to the entire house in case there is an emergency leak. Plunge the Toilet if they come across a clog. Plunge the sink if it backs up. 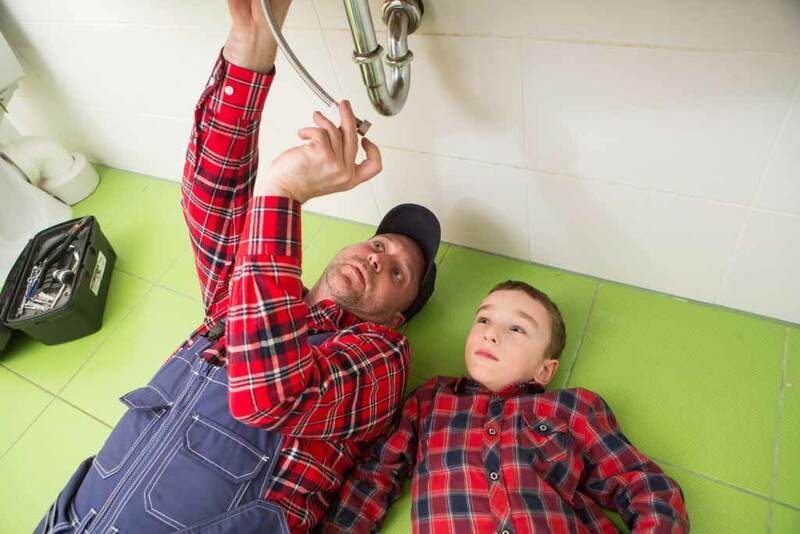 Teaching kids to be independent, strong and able to handle simple plumbing issues will be helpful for you both now, and in the future. Buy a wide array of connectors. Cut the PVC pipe into different sizes and lengths. Place all of the parts into a wading pool that’s filled half way with water.